Christo has completed The London Mastaba, a 20-metre-high sculpture floating on London's Serpentine Lake, which represents his and late wife Jeanne-Claude's determination to make art free. Based on the trapezoid shapes of mastaba, an Arabic word for bench given to Egyptian tombs and seats found outside homes in ancient Mesopotamia, the temporary sculpture is the realisation of the artistic duo's shared dream of creating a floating version of a form that has fascinated them for half a century. 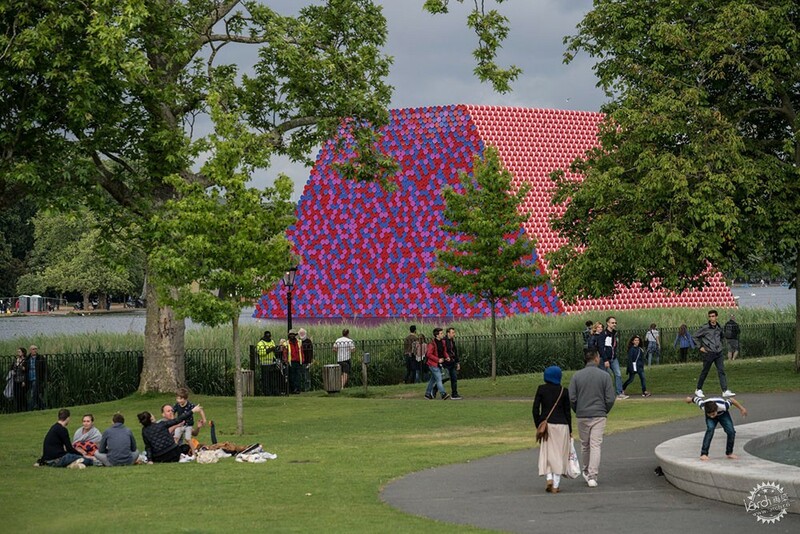 The London Mastaba, which is made of 7,506 painted barrels secured to scaffolding and anchored in the lake, was entirely self funded and is free to view by all. Although the work has been produced in conjunction with the Serpentine Galleries summer exhibition of Christo and Jeanne Claude's work, the artist has maintained independence from galleries, government grants or patrons. "I grew up in a terrible time in Stalinist Bulgaria, I escaped from there at the age of 21 to be an artist, free, with no restraint," Christo told Dezeen at the unveiling of his sculpture in Hyde Park this morning, 18th June 2018. "I won't give a millimetre of my freedom [away] and damage my art," he said. As with all of Christo and Jeanne Claude's installations, the money was raised through the sale of original artworks. There are no assistants; all the pieces are made by the artist. "This is why I do the things I like to do," added Christo. "Nobody commissions these things, they are decided by us, nobody asked us to build a mastaba. This is all the unstoppable desire to do works of art." Christo survives his late artistic partner and wife Jeanne-Claude, who died in 2009. They were born on the same day in 1935; Christo in Gabrovo, Bulgaria and Jeanne-Claude in Casablanca, Morocco. After meeting in Paris they began to collaborate on their public art works in 1961. Beginning by using wrapping cheap and available paint cans in fabric, the pair scaled up to using discarded barrels to create temporary, guerilla-style artistic interventions in the streets of the French capital. Intrigued by the possibilities of the mastabas form, the pair pursued many as yet unrealised plans to build painted barrel towers in cities and landscapes around the world. Christo is still determined to realise their most ambitious plan yet; a 170-metre high barrel mastaba for the Abu Dhabi desert. 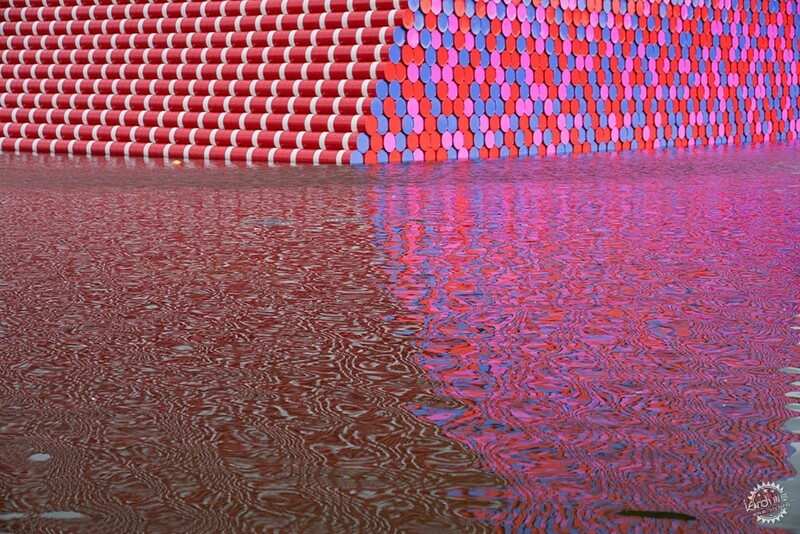 The London Mastaba is the first large-scale sculpture by Christo and Jeanne-Claude to be realised in the UK. Construction began on 3 April 2018 by a team drawn from JK Basel, Deep Dive Systems, and Coventry Scaffolding, with engineering help from Schlaich Bergermann Partner. Interlocking high-density polyethylene has been used to create a floating platform that is held in place by 32 anchors, each weighing 6 tonnes. The barrels are supported by a steel frame and scaffolding system. The whole sculpture weighs in at 600 tonnes and covers one per cent of the lake's surface. Its mosaic of vertical painted ends of the barrels in red, blue and mauve create an impressionist-style effect against London's skyline and in the shimmering reflection of the lake. A different red intersected with stripes of white has been used for the slanted walls either side. Christo chose the colour scheme specifically to interact with the green and blue of the public park and its lake, and London's skyline against it's notoriously changeable sky. "I feel very happy, very excited," Christo told Dezeen about finally seeing one of his barrel mastabas realised and opened to the public. "You know, it is all about senses, you can't put it into words. It's the physical, visual senses." 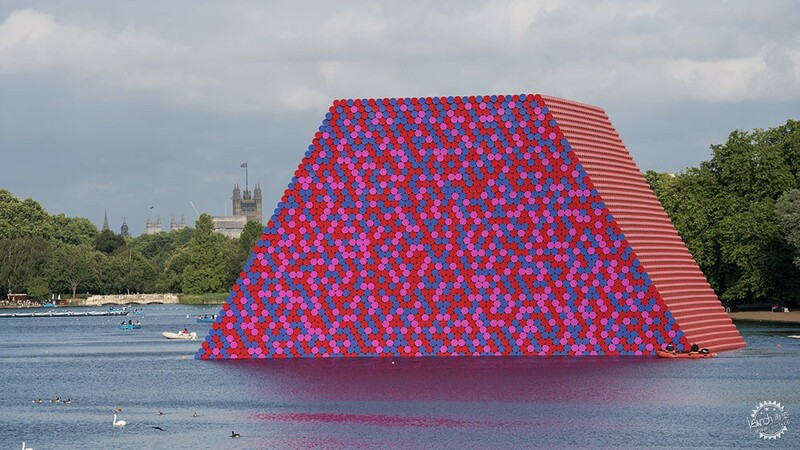 The London Mastaba will float on the Serpentine Lake in Hyde Park – freely viewable by the general public – until 23 September 2018. Christo and Jeanne-Claude: Barrels and The Mastaba 1958-2018 is at the Serpentine Galleries 19 June until 9 September 2018 and is free to visit. Photography is by Wolfgang Volz.